Published: Dec. 9, 2013 at 02:52 a.m.
(3:41) (Shotgun) T.Brady pass deep left intended for J.Boyce INTERCEPTED by D.Jackson at CLV 44. D.Jackson to CLV 44 for no gain (J.Boyce). 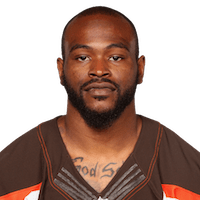 Published: Dec. 8, 2013 at 01:38 p.m.
Cleveland Browns linebacker D'Qwell Jackson picks off a pass in the first quarter thrown by New England Patriots quarterback Tom Brady.